The Circus is Coming, The Circus is Coming... 11/3-11/27 (Chicago-Area) | A Savings WOW! It’s that time of year where the kids can enjoy a good circus! 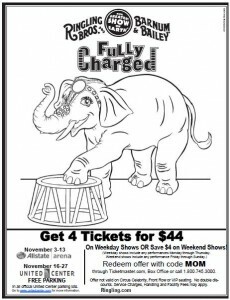 Ringling Bros. and Barnum & Bailey presents Fully Charged is coming to the Allstate Arena in Rosemont, IL from November 3rd through the 13th and to the United Center in Chicago, IL from November 16th through the 27th. Don’t miss Fully Charged, the all-new surge of circus entertainment from Ringling Bros. and Barnum & Bailey® where megawatts of thrills explode off of the arena floor with breathtaking dare-devilry, superhuman stunts and never-before-seen performances that energize Children of All Ages! The Fearless Fernandez Brothers dial up the thrills as they perform daring feats of athleticism on the Twin Turbines of Steel, including, extreme jumps and twists inside the moving wheels! Audiences will crackle with excitement as they watch Guillermo perform a three hundred sixty degree flying forward somersault, three stories in air, a feat so difficult it has only been attempted by one other person in the 141-year history of Ringling Bros.The Human Fuse, Brian Miser, sets the arena sky ablaze as he rockets through the air from his self-made human crossbow. Don’t blink as he flashes across the sky in less than a second, and travels 80 feet at 65 miles per hour. Ever wonder how many clowns it takes to change a light bulb? The hilarious hoopla continues to flow as the clowns from the world-famous Ringling Bros.® clown-alley, charge-up the audiences’ funny bones with hysterical silly antics and clownish comedy. Use code MOM when you go to this Ticketmaster page to purchase seats for Fully Charged — and get 4 weekday performance tickets for $44 or save $4 on all weekend tickets! Download this coloring sheet and print it out for your little ones to get excited about the circus! You’ll also find more information about the discount. Buy your tickets to the Ringling Bros. and Barnum & Bailey presents Fully Charged today!